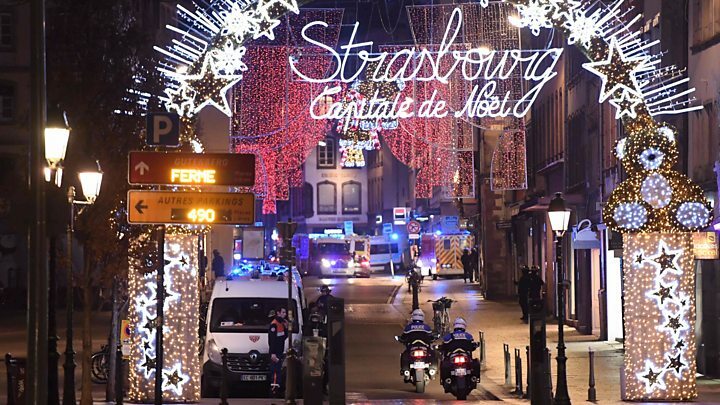 A gunman opened fire near a crowded Christmas market in the eastern French city of Strasbourg, in an attack that killed five people. The attack on the evening of 11 December also injured another 11 people, four of whom are still in hospital. The main suspect in the attack, 29-year-old Cherif Chekatt, was shot dead by police on the evening of 13 December. Hundreds of officers had been involved in the search for the suspect, who was well known to the authorities for previous criminal offences. The attack began at around 20:00 local time (19:00 GMT) on 11 December close to one of Strasbourg's central squares, place Kléber. The attacker was seen holding a gun outside 10, rue des Orfèvres in the centre of the city, prosecutor Remy Heitz said on Wednesday. He then went around the area, down the following streets in succession: rue des Grandes Arcades, rue du Saumon, rue des Chandelles and rue Sainte-Hélène, before going on to rue du Pont Saint-Martin. Along the way he opened fire several times and also used a knife to seriously wound and kill people, Mr Heitz added, saying the suspect yelled "Allahu Akbar" ("God is greatest" in Arabic) during the rampage. When faced by four soldiers of the anti-terror Sentinelle operation, he fired in their direction. They fired back, wounding him in the arm. He managed to reach a taxi which drove him away from the scene and dropped him in the vicinity of the police station in Neudorf, the area where he lived which sits on the border between Germany and France. The taxi driver, who has spoken to the police, said the man had asked to be taken to that district without giving an address, saying he would guide him there. The driver also said he could see the man had a hand gun and was wounded. To explain the origin of his wounds, the suspect said he had killed 10 people and that he had been injured in a firefight with soldiers. After he got out of the taxi, the gunman came across police officers and exchanged fire with them. The suspect also told the driver that a grenade had been found at his home that morning. That allowed investigators to link the man with a police search undertaken earlier on Tuesday. During that operation, which was part of investigations into a robbery and a homicide, police had found a defensive grenade, a loaded rifle and four knives, the prosecutor said. How was the suspect killed? As a result of testimonies from the public, an extensive police operation involving a helicopter was launched on Thursday evening at 19:30 local time (18:30 GMT) in the Neudorf area, where Chekatt was last seen after the attack. At 21:00, Chekatt was spotted in rue du Lazaret by officers in a police car, Mr Heitz said on Friday. The suspect noticed the police car and tried to enter a building at number 74, but could not get in. The officers identified themselves, and he turned around, pointing a gun - similar to the one used in Tuesday's attack - and fired in their direction, hitting their car, Mr Heitz said. Two of the three officers fired back several times and killed the suspect. He was identified through his fingerprints and declared dead at 21:05. Born in Strasbourg in February 1989, Chekatt was already known to the security services as a possible Islamist terrorist threat. He is thought to have become radicalised during his time in prison, and was noticed by the relevant authorities in 2015 for that reason. He was placed on the "fiche S" watchlist of people who represent a potential threat to national security, and was being monitored by the DGSI, France's domestic intelligence agency, Mr Heitz said on Wednesday. Seven people were arrested in connection with the attack - four members of his family as well as three other people close to him. However, all but one were freed several days later. A Thai tourist was one of the victims, named as Anupong Suebsamarn, 45, by Thai media reports. He had recently arrived in the country on holiday, they say. He was killed with a bullet in the head on rue des Moulins, according to local TV. 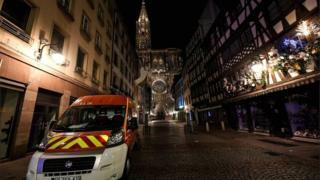 Another victim was a retired bank worker, aged 61, from Strasbourg. He died on rue des Chandelles, local TV reported. The third victim was Kamal Naghchband, a garage mechanic and father of three originally from Afghanistan. He had been visiting the market with his family and was shot in the head, his cousin told the AFP news agency. The fourth victim was 29-year-old Italian journalist Antonio Megalizzi. He was critically injured and later succumbed to his wounds. His death was announced three days after the attack. Polish national Barto Pedro Orent-Niedzielski, 35, has been named as the fifth victim by French media. He was in a deep coma for five days after being hit in the head before succumbing to his wounds on Sunday, Le Monde reported.